The name O3B refers to the "Other 3 Billion" and is primarily intended as a backhaul service for cellular phones in remote countries that do not have a wire line infrastructure. They will also be serving existing, high end maritime markets like the cruise industry. 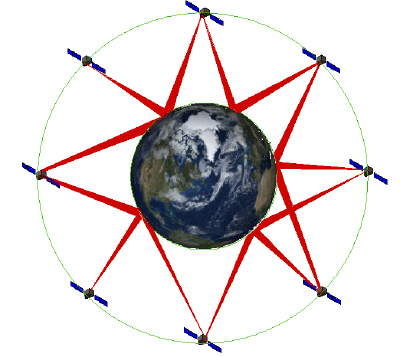 The constellation of 12 to 20 satellites, scheduled to launch in early 2013, will be in a circular MEO (Medium Earth Orbit) orbit at a distance of about 8063 km from the earth. Each satellite will have 12, fully steerable, Ka-Band antennas of which 2 will target the terrestrial gateways and 10 will target the coverage areas. Each beam will have a throughput capacity of 600 Mbps in each direction. The beam footprints will have a diameter of about 600 km on the earths surface between 45oN and 45oS and will be dynamically steered as the satellite moves, to cover the required areas and skip over the unpopulated (or non-contracted) areas. Eight satellites will be spaced 45 degrees apart, orbiting around the equator, in a non-inclined orbit. Due to the much lower orbit, the latency will be in the region of 130 milliseconds, round trip, as opposed to about 720 milliseconds for geostationary satellites. This will be a huge improvement for telephone calls and data thoughput. The beams will target specific areas under contract, and in the case of maritime installations, the beams can actually follow the movement of the ship to optimize coverage. The ship will require two tracking antennas, each tracking a different satellite, and switching from one to the other as the satellites rise and set. It is expected to begin service in mid-2013. O3B Networks have been awarded a contract by Royal Caribbean Cruise Lines to provide high-speed broadband service to the their Oasis of the Seas, which is the world's largest cruise ship carrying 8000 passengers and crew. Two stabilized antennas, installed onboard the ship by Harris Caprock, will track each visible satellite and allow seamless hand overs as one satellite is setting and another rising. The satellite beams will also track the ship, keeping the ship centered in the beam, as it moves around the Caribbean. The system will use a ViaSat High Speed modem. There will be a third, hot standby antenna and modem onboard for redundancy. The low latency and high speed throughput will be vastly superior to the geostationary satellites used today. 42817 visits to this page since 28 Nov 2012.